As I wrote before The Convergence…Future’s End had a terribly flat ending. 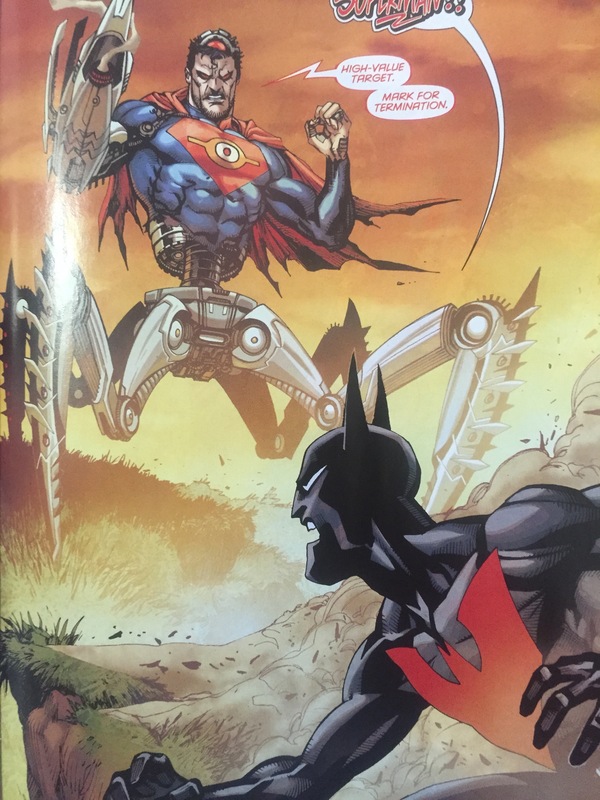 The cliffhanger led me to believe that Batman (Beyond) would be featured in a new title…or something…after the convergence. Looks like I was correct. Looks like I was also correct in skipping The Convergence. A meaningless crossover. Looks like the front cover is also showing us other characters from “the Beyond” story. Justice League characters The Flash and Superman are evident. Not sure that I can name the other guys. My experience with Batman Beyond is pretty limited. I am seventeen years older than my youngest brother, and he would watch the cartoon every now and then. A couple of years ago, I snatched up “Batman Beyond: Return of the Joker.” I had a hard time getting past some jarring things about it…one of them being the language. At the time I felt my children weren’t old enough to watch that, so I watched it on my own later. 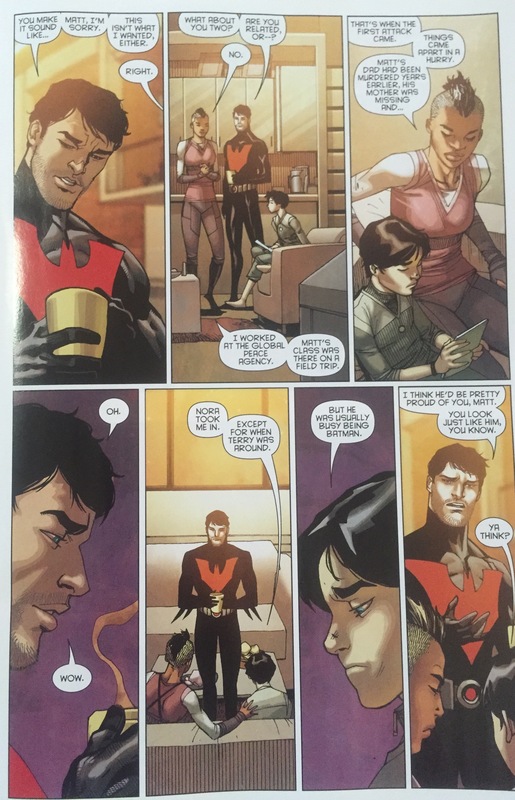 I picked up a few things about Terry McGinnis’ universe. And people use the word “slag” alot. 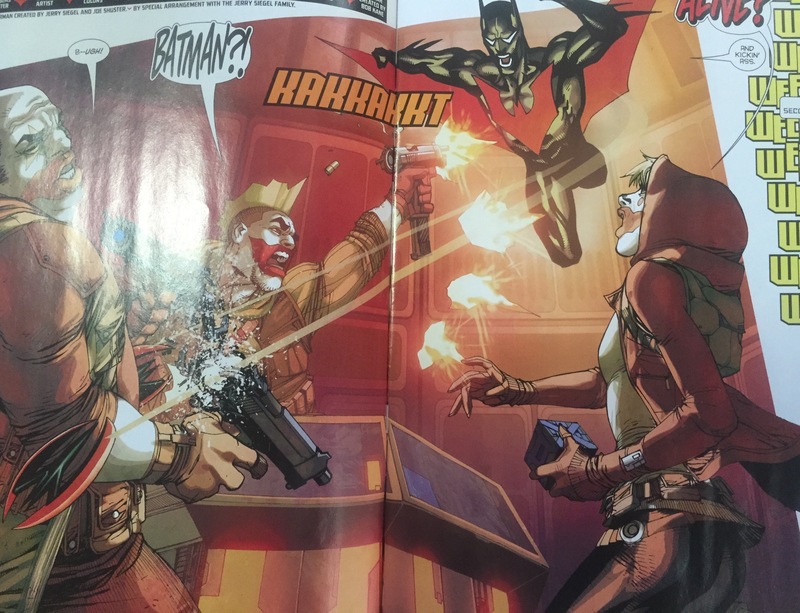 It bothered me that Tim Drake was made into Joker and Harley’s adopted and brainwashed son. And besides Future’s End, that’s it…So I can’t say too much to die-hard Batman Beyond fans. What I do like is that this is a “new” Batman Beyond, with Tim Drake in the suit. The art inside wasn’t as bad. I have picked up that Terry’s future had a super-gang of Joker copycats. So right away, we are given a taste of something familiar from the Batman Beyond universe. But something is inconsistent with the Future’s End universe…Terry came 30 years into the past from a time when all of humanity was destroyed and assimilated into “bugs”. This panel indicates that Gotham at least isn’t made of all bugs. But as the story goes on, this seems to be something changed in all of the time jumping that Terry did. The Statue of Liberty always seems to be a favorite thing to smash in Sci-Fi….Writers do this for us super-patriotic comics fans. It definitely gets our attention. But it’s a little cliche. Not going to give the ending away…but looks like Superman is a bug. Who was that guy on the cover? 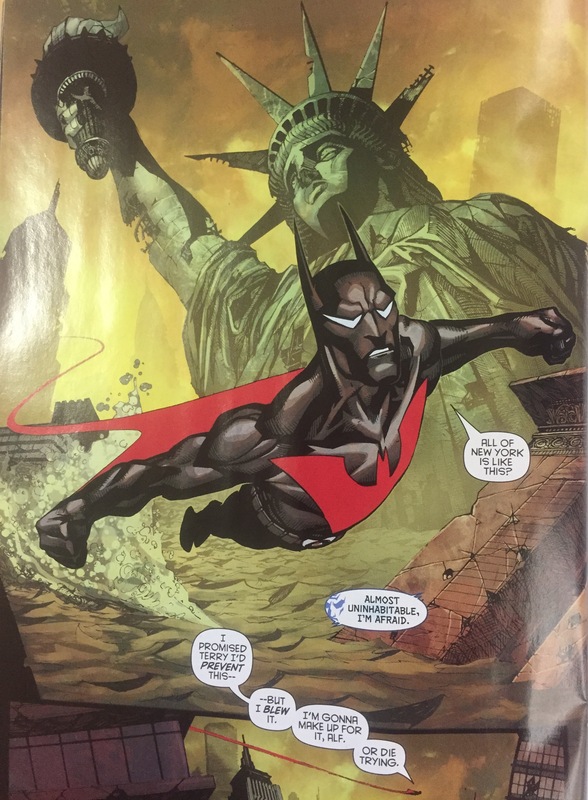 SpartanNerd Rating of DC Comics New Universe Batman Beyond #1 is 4/5. The art on the cover led to me taking a point off. But I think I will definitely read this for awhile…at least to mitigate the bad taste that Future’s End left for me. 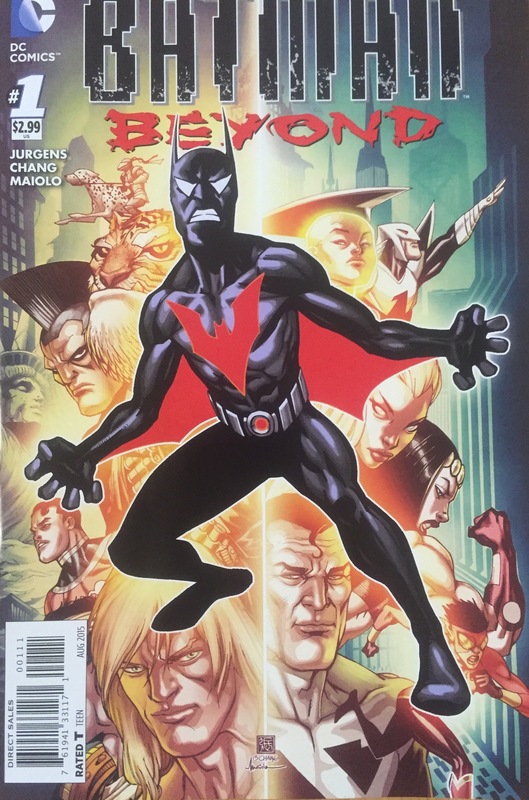 I would like my readers who know about Batman Beyond to send me some cool information that I need to know….